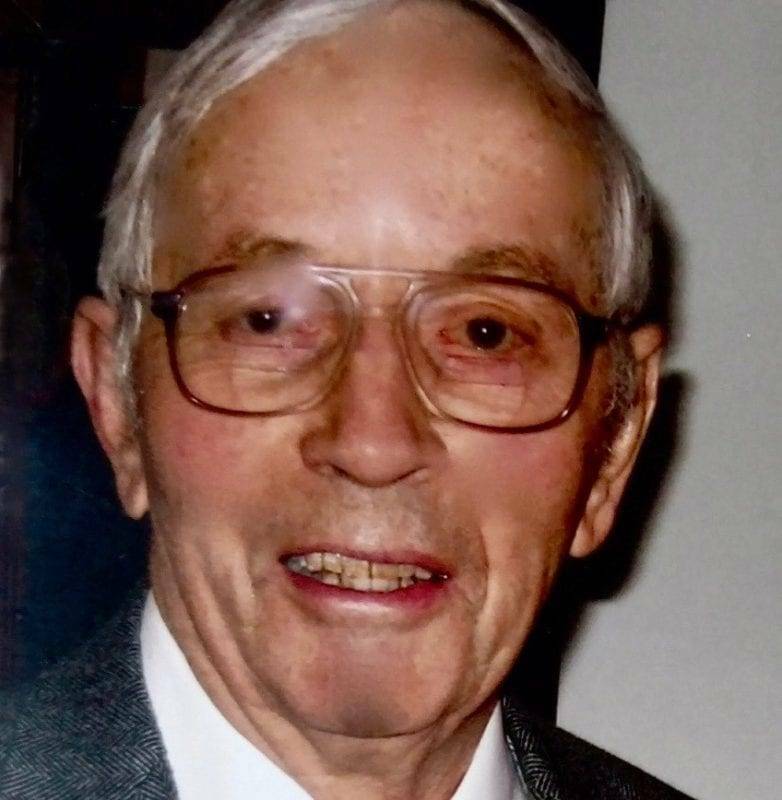 Vernon Clark Sloan, age 91, of Stryker, Ohio, passed away October 7, 2017, at his home. He was born January 22, 1926, to Otis and Dora (Mann) Sloan on the family farm, and worked the land and raised livestock throughout his life. Following graduation from Stryker High School in 1944, Vernon joined the U.S. Army and served in the Pacific Theater toward the end of the war and post-war, primarily in the Philippines and Korea, with the 1st Infantry Regiment (Semper Primus) which was attached to the 6th Infantry Division. His military service and the hunger he witnessed among the rural people in these countries made a strong impact on him and influenced his beliefs and involvement throughout his adult life. In mid-life, these beliefs led him to initially organize efforts among area churches and farmers to deliver high-lysine corn to people in Haiti, Honduras, Angola, and Liberia; in 1999 he and a few others co-founded Foods Resource Bank, a Christian-based response to address hunger through sustainable agriculture that now operates in more than 30 countries around the world and has impacted more than a million people. For many years he volunteered his time on its board of directors. In 1954, Vernon married Carol Bretthauer, whom he met at a 5-H dance in Bryan, and together they had six children: Rebecca (Judd) McClarren, Pettisville; Julia Sloan (Oleg Smirnoff), NY, NY; Diana Sloan-Basner (Ralph Basner), Palmer, AK; Marcia (Bob) Latta, Bowling Green; Scott (April) Sloan, Stryker; and Lisa Sloan, Worthington. In addition to his children and Carol, he is also survived by 10 grandchildren and 8 great-grandchildren. He was preceded in death by his parents and siblings Gertrude Goachee, Virgil Sloan, and Donna Belle Jones. Vernon was a strong believer in his Christian faith, in service to others, and in agricultural development. His life was one of deep commitment and leadership in each of these areas, with a lasting impact in Williams County and in several developing regions of the world. Among his leadership positions, he served as chairman of the building campaign for the United Methodist Church of Stryker, was co-chair of the building campaign for the Springfield Township Park, was a founder and past president of the Williams County Pork Producers, the Williams County Soil & Water Conservation District, and the Williams County 4-H Endowment Committee. He was also very active in Farm Bureau. For many years he served as a 4-H advisor and always assisted club members at the county fair. His long involvement and support led to his induction into the Ohio 4-H Hall of Fame in 2013. He was also active in the Stryker American Legion, the Williams County Fair Foundation, and many other agricultural and service organizations. In support of the Foods Resource Bank mission, Vernon and Carol visited several African and Central American countries to share agricultural practices. They also hosted several young farmers from these countries during planting and harvest seasons. For these efforts Vernon received the Heart for the Hungry Award from the international organization “Stop Hunger Now” in 1998. He was named the Stryker Chamber of Commerce Citizen of the Year in 2000. Music was a very important part of Vernon’s life. In addition to playing trombone when off-duty in the Army band and the local community band, he also sang in many choirs and gospel quartets throughout his life. The family requests that any memorial gifts of tribute be given in Vernon’s memory to the Foods Resource Bank, the Stryker United Methodist Church, or the Williams County 4-H Endowment Fund. Be the first to comment on "Vernon Sloan (1926 – 2017)"